Performance Time: Approximately 20-30 minutes, 45 pgs. MONOLOGUE COLLECTION. Showcase your comedic acting skills with this collection of ten monologues, which features a host of wacky and memorable characters. In “CSI: Elementary,” a crime scene investigator poses as a substitute teacher to solve the mysterious disappearance of an elementary school teacher. In “Heart of Gold,” a woman confronts her ex-boyfriend with her new love, a goldfish. In “A Thousand Words,” Sarah meets her future in-laws and realizes she might be marrying into the wrong family. In “Teacherdroid,” a student suspects that her history teacher is a cyborg. In “The Sit-In,” a diner patron demonstrates his love for one of the servers. In “Cookies,” a disgruntled girlfriend discovers her boyfriend is only interested in her mother’s cookies. In “Presto Espresso,” a small town resident drinks a few too many frappuccinos and lattes when a new coffee shop opens. In “Olympic Gold,” a young mother proudly watches her child participate in her first gymnastics class. In “Frosted Options,” a runner finds a Pop-Tart on the road and decides to eat it. 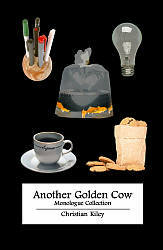 In “Another Golden Cow,” a frustrated teacher tries to persuade the principal to purchase some red pens, grade books, and light bulbs.